We’ve been using Joie Mimzy Snacker high chair for a few months now, so I think it’s a good time to write a review about how we are getting on. Overall, I’ve been happy with this purchase, it’s got some lovely features, although it’s not without faults. It’s very safe and comfortable for my little one. We bought it when my daughter was about five months old when we wanted to start introducing solid food. As she couldn’t sit unsupported then, we used it in a semi-reclined position but have since moved on to an upright position only. If you want to know the good and the bad, then read on as I inform you about all the details in this Joie Mimzy Snacker high chair review. This unisex high chair has three reclining positions, easy to fold mechanism (can be folded and unfolded with one hand), removable and adjustable tray with cup holder, five point safety harness, leg safety part, storage basket to keep some of the baby’s essentials. It is also very light, an extra bonus. It took me a while to decide which high chair to buy. I didn’t want anything too expensive, but I also didn’t want to compromise on safety and practicality. I think this high chair has a right balance of both. This is great when your little one doesn’t sit unsupported yet. And many children don’t quite master this skill at six months old. Why six months? That’s the average age when babies start eating solid food, so it’s also a good time to get a high chair for them. They can stay in semi-reclined position, for better comfort. 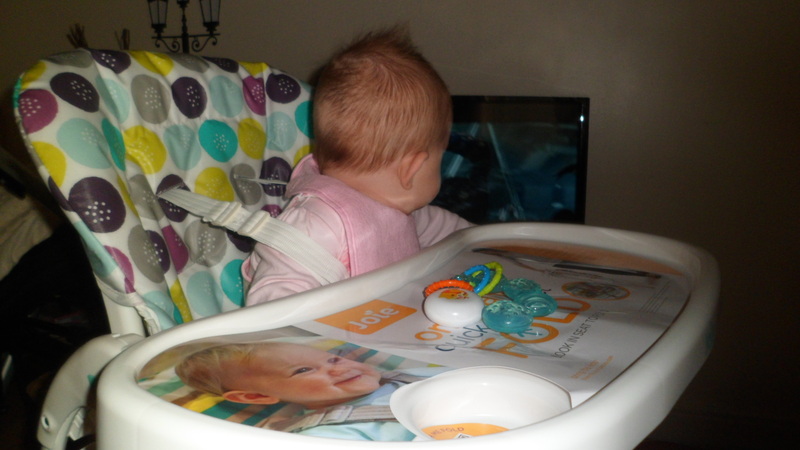 We bought the high chair when my baby was five and a half months old, and she didn’t sit unsupported until much later. As a result, this feature came very handy. She could stay comfortably in semi-reclined position while taking her first mouthfuls of real food. We don’t use this feature anymore, though. Great at the beginning, but pretty pointless when your baby gets older. So, it’s definitely not a necessity when choosing the right high chair for your baby. 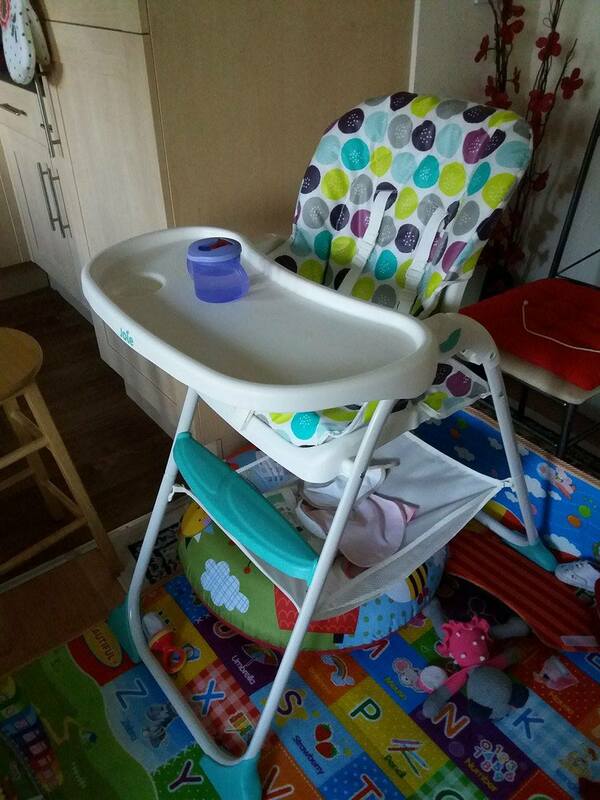 This high chair is very easy to move around, feels very light, but it’s also very sturdy and safe. At nine months, my baby is making her first attempts of climbing on things, and the high chair seems to be her favourite discovery at the moment. It is very solid at its base and stands firmly. However, I still keep an eye on her all the time; you can never be too cautious with babies, right? Although I keep it unfolded most of the time, it couldn’t be easier to fold and store somewhere in the corner if your space at home is limited. When it’s folded, it’s free standing. 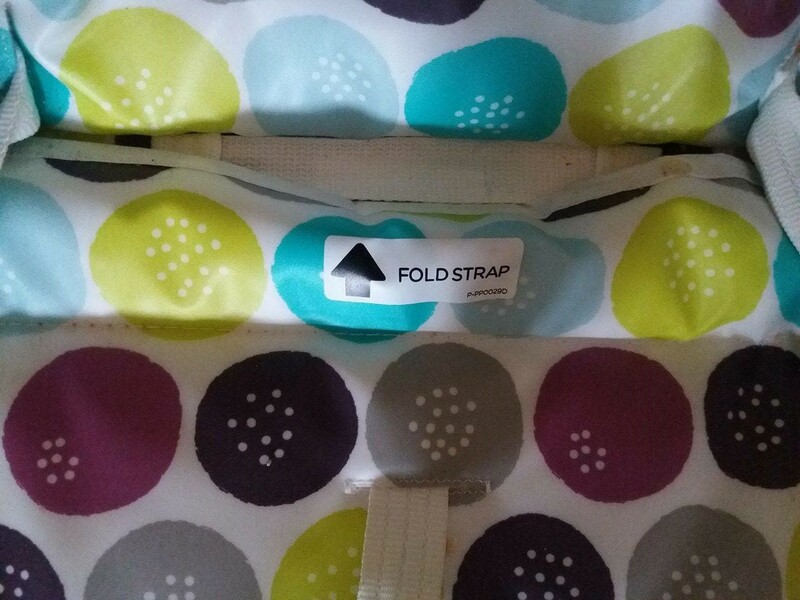 You can fold it simply by pulling on the fold strap which is tucked away on the seat under the seat pad. Couldn’t be easier. For easy cleaning, the tray can be removed. You can also reposition the tray to suit your child’s requirements and size. The cup holder is a bonus, although the cup my baby uses at the moment has two handles and is therefore too big for the holder. It doesn’t bother me too much, though. It wouldn’t stay there anyway, as my baby likes to grab everything that’s within her reach. This wasn’t one of the main criteria when I was choosing a highchair, but it proved to be very handy. It’s perfect for keeping baby wipes, and baby bibs close by. As I found out when we started with solid food right away, there’s just never enough of those. Yes, it really is a messy business. On the downside, some of the baby’s food also do end up there, but for me, it’s only a small price to pay for the convenience of having some of my baby’s essentials within reach. I love the design of this high chair. It’s unisex, which is great if you plan to have more children like I do. Whenever possible, I try to get neutral colours and designs of most baby essentials I buy so that they can be used for boys as well as for girls. Although the seat has a wipe clean and washable cover, the cleaning is still a bit of a headache. The high chair has some nooks and crannies, making it a bit tricky to wipe. And as you can see on the picture above the fold strap is hidden under the seat pad. That’s even more tricky area to clean. I found that the best way to clean this is by folding the high chair down. It’s time-consuming, but I don’t have to do it on a daily basis, which is good. Great space saving high chair when folded but the foot space is quite wide when in use. I guess that’s because the high chair is so light and needs to be supported in this way. Luckily, it’s not a big problem for us, but it may be an issue if your dining area is a bit tight. White straps on a baby high chair. I mean, seriously?? White colour and babies just don’t mix well together. White simply doesn’t stay white for long when babies are around. After few months of use, our straps aren’t too bad, but at this stage, the majority of feeding is still by spoon. What happens when my little one starts using hands to feed herself? We shall see very soon, I guess. I think it would work better if the safety bit was attached to the seat rather than the tray. 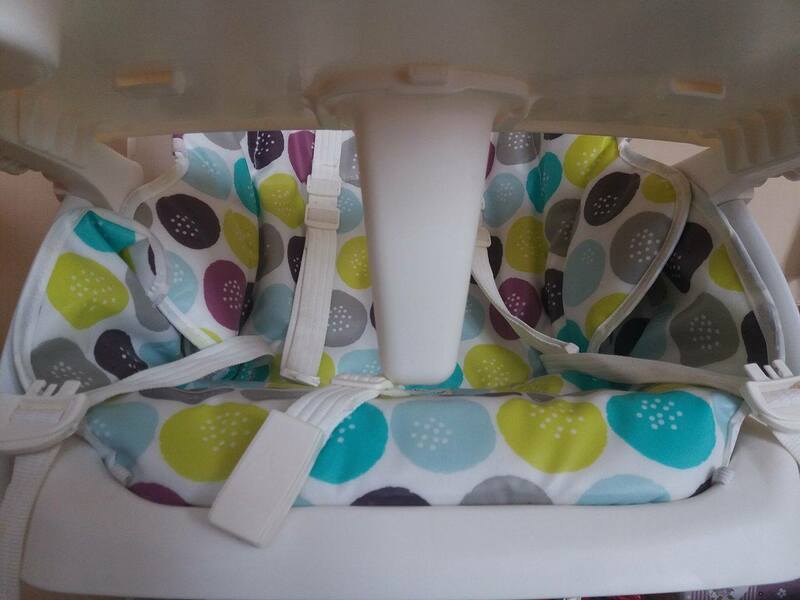 It would feel even more secure once the tray is removed, as it’s only the strap in the middle that’s holding your baby. This high chair represents a good value for money. Would I recommend it? Yes, I would. The storage net and folding mechanism are a huge selling point for me. Although it’s got some flaws, my baby seems happy in it. I found out that the cheapest place to get it is from Argos. Do you have experience with this high chair? Or, perhaps, you love a different one you own. Get in touch. Hi there, I was looking for a highchair as a gift for my brother’s new baby when I landed on this review. This product has all the modern look and safety features that I am searching for. I particularly like the strap that goes around the baby – you’ve no idea how many times I’ve heard of stories babies falling over when their parents weren’t watching. Just curious to know, do they only come in one design? Thanks! Hi and welcome to my site. Safety should be the main priority when choosing a high chair. With Joie high chair, you can rest assured that your brother’s baby will be safe and comfortable at the same time. There are more designs available, you can check them out here.